Le Blog de Frivole: Qanik... and the generator says? Qanik... and the generator says? 7, 13, 21, 11, and 22. That's the order in which the numbers came out and they are: Sillystring, Joschaocchi, Jenn, Margaret and Bernice. Please kindly send me your email using the link on the right column ("Contact Frivole") and I'll send you the pattern. Added 20.11.17: I decided to draw one more name as Joschaocchi (one of the winners) had been one of my testers so she already had the pattern. Number 10 came up, that's Janemactats (pattern already sent!). I really fiddled a lot with this pattern, making very small changes right up until today. But that's it now. I'm sending it out so this is the final version. I must admit it's not that easy to get the long chains perfectly even. It is so easy to pull them just a bit tighter or looser and they really need to be as much the same length as possible. Still, even with a bit of unevenness, I hope you'll still enjoy how it looks and enjoy making it. I also ended up adding picots in the very centre and I think that marries better with the look of the picots on the arms and between them. 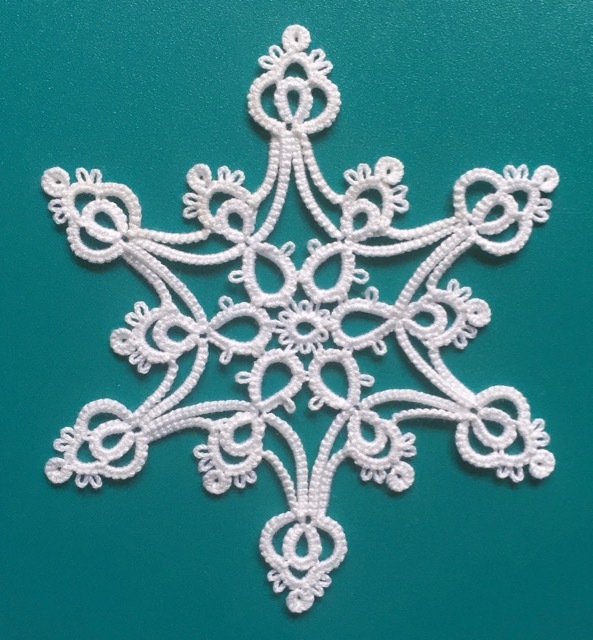 Getting chains the same length is one reason why I like tatting them with unflipped stitches: when I tat this way, I pull each stitch as I make it but I do not snug the chain at the end (like I do when I tat chains with normal, flipped stitches). I find this makes my stitches, and my chains, more even. 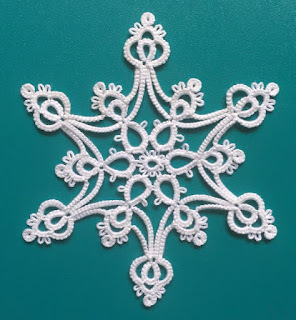 During tatting, the points end up leaning a bit and I find this design and its long chains benefits from blocking to get it looking its best. I've made so many samples of Qanik now that I have plenty to gift in my Christmas cards to friends and family. I think I'm happy to move on to the next project. Congratulations to the winners! I'll be checking out your Etsy shop soon! Gorgeous, love the center modification! Lovely! Congratulations to the winners. 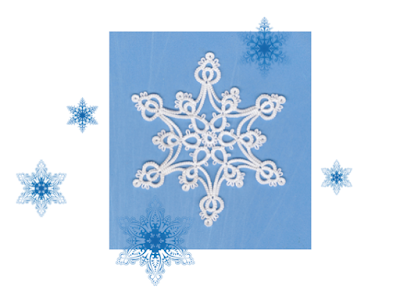 Thank you Joelle, it's a beautiful snowflake I will enjoy tatting it. Love this - is it available to purchase yet? Also - would love to testat for you if you need anyone ...been tatting since my teens. Thank you so much! I love your patterns and look forward to adding this snowflake to my Christmas tree :). Thank you so much, I can hardly wait to make this pattern and hope my chains will look good.